Most people who are familiar with the Bible are familiar with the fact that Sarah was the wife of Abraham. However, some do not know that Sarah had another name before she was named Sarah. Likewise, in the light of who Abraham was, Sarah held an important position and played a great role in the establishment of the Jewish people. 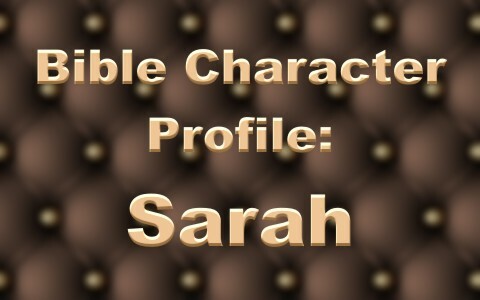 Sarah was born as Sarai and raised in the Ur of the Chaldees, which is located in modern day Iraq. It was located on the Euphrates River not far upstream from where the Euphrates and Tigris Rivers join. Sarai was married to Abram, whom we know as Abraham. Abram was the oldest of three sons of a man named Terah. Abram had two other brothers, Nahor and Haran. However, his brother Haran died, leaving behind a son whom we know as Lot, and a daughter, Milcah, who became the wife of Abram’s brother Nahor. After Haran’s death, Terah took Abram and Sarai, along with Lot, and left Ur of the Chaldees. They traveled far up stream to the land of Haran where they lived until Terah died. Abram, being the oldest of the sons, adopted Lot, his nephew, into his family and not long after, they left as God directed them to what would later become Israel. Sarai was barren (Genesis 11:30) so having Lot in the family provided her with the opportunity to be a sort of foster mother to Lot. However, for a woman not to be able to produce children on her own it was believed to be a sign that there was something in the woman’s life that was causing God not to bless her. This brought anguish, shame, and despair to Sarai. Since Sarai could not produce a child for Abram, she made a decision that would affect all of humanity. She decided to give Hagar, her Egyptian maid, to Abram to produce a child. Abram accepted Sarai’s offer to produce a child through Hagar and the result was the birth of Ishmael. However, more than just a child was produced. With the pregnancy, Hagar despised Sarai and Sarai became jealous and harsh with Hagar. Hagar then left and went into the wilderness of Shur. Pregnant and alone in the wilderness, an angel of the Lord spoke to Hagar. The angel told her to return to Sarai. He also told her that she would bear a son, Ishmael, because God heard her affliction. He said that Ishmael would be a wild man and his hand would be against every man and would one day have many sons and live in the presence of all his brethren in Shur. Ishmael would later become the father of all Arab peoples. It was after this that God spoke to Abram and made a covenant with him. As part of this covenant, God told Abram that he and Sarai would have a child that would be named Isaac. God also said that the covenant and blessings that went along with it would be established through Isaac and his descendants, not Ishmael (Genesis 17:18-21). During this conversation, God also changed the names of Abram and Sarai. He changed Abram to Abraham and Sarai to Sarah. With these name changes would come changes to Abraham and Sarah’s life. In Sarah’s case, God would bless her with the birth of Isaac. However, He would also make her “a mother of nations” and “kings of people” would come from her descendants. Despite these promises, both Abraham and Sarah both found it hard to believe as they were 100 and 90 years old respectively. In fact, when Abraham heard this he laughed. Later, when Sarah heard this she laughed as well (Genesis 18:9-15). However, as God had promised, Isaac, whose name means laughter (Genesis 21:3-7), was born and the covenant was established. Sarah died at the age of 127 years and was buried in a cave Abraham purchased in Mechpelah, known today as Hebron (Genesis 23). Sarah was a beautiful woman who initially lived her life lacking faith in God’s promises and ability to do what He said He would do. Her impatience resulted in poor decisions that revealed she could be jealous and harsh. However, as her faith grew, she became a great woman of faith that God used to fulfill His plan. Sarah’s story shows us that it does not matter who we are, where we come from, our age, nor any other personal strengths or weaknesses, God can produce changes in us through our faith that can result in miraculous influence in our personal and extended relationships for generations to come. Resources – Scripture quotations are from The Holy Bible, King James Version. Smith, William. Shur. Smith’s Bible Dictionary: Comprising Antiquities, Biography, Geography, Natural History, Archaeology and Literature Philadelphia: A.J. Holman & Co., 1901. WORDsearch CROSS e-book. Hello, it seems that you made a mistake with the age of Sarah. According to Genesis 17:17 she was “90” not “99”. Overall this article was very helpful and fun reading! Thank you Mr. Camp. We corrected this. We appreciate your help sir. Good but many lanuages are in the world,which will have know trth of BIBLE and Hope of their eternal life. some day in the here after, I would like to meet Sarah as well as all my deceased relatives….